http://roulette77greenland.com/hoe-te-spelen - hints, secrets and strategies to acquire. Unfortunately the manufacturers of Godiva Belgian Blends have not disclosed the levels of caffeine in their product. 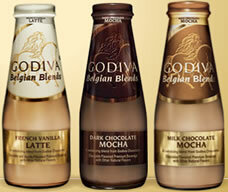 Godiva Belgian Blends are a selection of milk-based drinks from Coca-cola and Godiva (chocolatier). A number of flavors are available including Dark Chocolate Mocha, Milk Chocolate Mocha, French Vanilla Latte. The drinks contain coffee as well as added caffeine. Despite the fancy names, the chocolate flavor is from the cocoa powder. Sugar content: 35 grams (per 9.5 ounces).